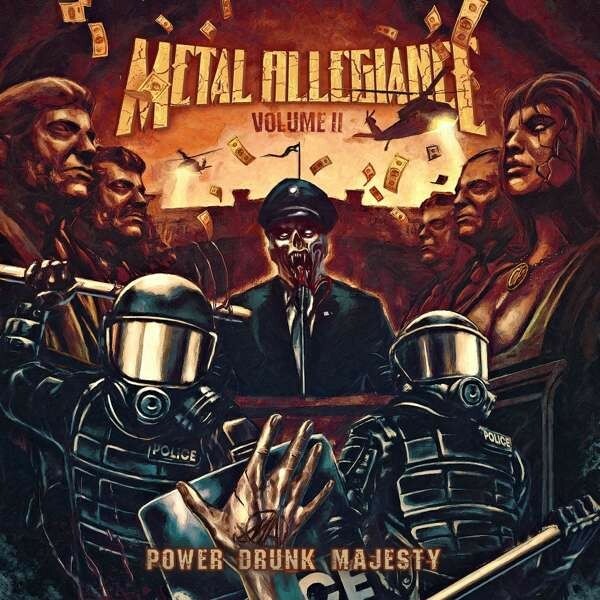 When Metal Allegiance released their self-titled debut album in 2015, many people thought that this was just a one-off jolly up between some stellar musicians who found themselves with a bit of spare time and would never be seen again. Therefore, large amounts of humble pie shall be eaten as they've returned bigger, louder and armed with some prime tunage. 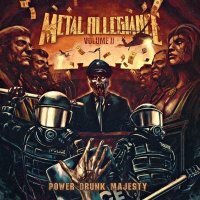 For those not familiar with the Metal Allegiance concept, it's the brainchild of song-writer Mark Menghi who has assembled a seriously salivating Metal supergroup. Musically, you've got Testament's virtuoso trash master Alex Sklonick on guitar and Megadeth's Dave Ellefson walloping the bass strings, however, the cherry on the cake has to be the man of a thousand bands, the iconic drum legend Mike Portnoy. Handling the vocal duties, you'll find quite simply a sumptuous who's who buffet of Metal front-people. From Accept's Mark Tornillo and Overkill's Bobby Blitz to Johan Hegg of Amon Amarth and Floor Jansen of Nightwish, this line-up has to be seen to be believed. 'The Accuser', with Trevor Strnad of Black Dahlia Murder, gets this headbangers banquet underway. After some Skolnick fret massaging, a dark, piercing trash-fest ensues, immediately laying out the album's intentions. 'Bound By Silence' takes things down a more traditional route with its bullish stomp and an old-school vocal by ex-Anthrax man John Bush. No disrespect to the opening two singers, but when you hear Blitz leading the charge on 'Mother Of Sin', you know the quality has immediately ramped up. Without a doubt, this tune could square up against any of the biggest anthems in Metal and the performance given by Blitz proves, even at fifty-nine years young, that he's still at the peak of his powers. Although best known for his adventures in the Prog arena, on this record Portnoy sounds like he's truly at home when it's hard, fast and bloody loud. He rips his kit a new one on 'Terminal Illusion' with an angry Tornillo belting out a tune gift-wrapped in Accept DNA. The crowning moments lie in both parts of the title track; Death Angel's Mark Osegueda completely bosses the galloping first segment, and tees up the always-engaging Jansen who reigns supreme with the majestically epic closer. This is an album that grows with every spin. For me, it's a contender for Metal Album Of The Year.